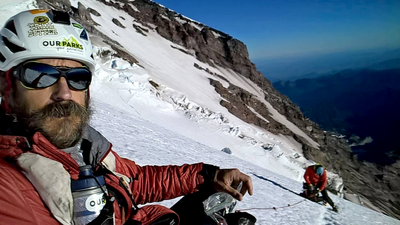 Our Parks | Your Adventurers Gavin Woody and Ras Vaughan successfully completed the first ever ‘Rainier Infinity Loop’ to raise funds for Mountaineers youth programs! You can join them by answering a matching gift challenge by Aug 25. 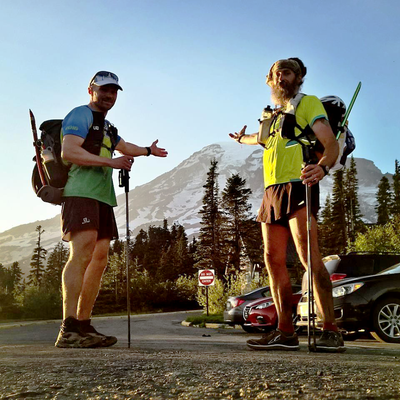 On Saturday, July 23, Adventurers Gavin Woody and Ras Vaughan set off to complete the Mount Rainier Infinity Loop: climbing Rainier twice and running the Wonderland Trail in both directions. Ninety-nine hours and seven minutes after setting off, Gavin and Ras completed the unsupported adventure to raise funds for The Mountaineers youth programs, covering 120 miles and 40,000 vertical feet. The Infinity Loop is a route dreamed up by iconic Washington climber Chad Kellogg – a route he was never able to complete due to his untimely passing in a climbing accident in Patagonia. Chad called it the Infinity Loop. The idea was to climb to the summit, run the Wonderland trail back to the starting point in one direction, climb to the summit again, and then run the Wonderland the opposite direction back to the starting point, thus tracing a figure eight, or an infinity sign. “Our Mount Rainier Infinity Loop attempt is meant to be a celebration of the amazing and extraordinary things that human beings are capable of. Gavin and I are drawing our inspiration from the life and adventures of Chad Kellogg, and hope to send that energy and inspiration reverberating out into the world to inspire others as it has us. And we also hope to use this project to inspire future generations of climbers, runners, thru-hikers, fastpackers, backpackers, and adventurers of all stripes by helping raise money for The Mountaineers Youth Programs by means of the Our Parks | Your Adventure initiative,” explained Ras. Gavin has been a key supporter of Mountaineers youth programs since 2012 when he dedicated his Ultra Trail du Mont Blanc ultra-run to support Mountaineers youth programs. He did it because he wanted all kids to be inspired to experience challenge in the outdoors. Gavin and Ras achieved their incredible adventure goal. You can help them achieve their challenge goal to raise $5,000 by donating today. Whether you give $10 or $5,000, your donation will help introduce deserving young people to the fulfillment and enrichment of outdoor adventure. Your gift will inspire the next generation of protectors of our wild places. Plus, if you make a donation by August 25 your donation will be matched dollar for dollar thanks to a matching gift challenge from Rich and Martha Draves. This means that if you donate $10 dollars, our youth programs receive a total of $20. If you donate $5,000, the programs receive $10,000! Donate and celebrate Gavin and Ras' achievement today. To learn more about this incredible achievement, read Ras's Blog or follow The Mountaineers Facebook page. In celebration of the National Parks Centennial, we launched Our Parks | Your Adventure, a fundraising opportunity to inspire you to choose a challenge in our National Parks. Our goal is to raise $40,000 between July 1 and September 5, 2016! OPYA was inspired by Gavin - the quintessential adventurer. As you can see from his personal OPYA challenge with Ras, when it comes to taking on personal challenge, he's got it turned up to to eleven. A few years ago, Gavin suggested we hold an adventure-based fundraising event to give members a fun way to support our youth programs. Since the launch of our Mountaineers youth programs, we’ve connected over 8,700 youth from all backgrounds (60% are kids who wouldn't otherwise have outdoor opportunities) to the outdoors to inspire a healthy, active outdoor lifestyle. With your participation in Our Parks | Your Adventure, you will help us continue to connect thousands more kids to the outdoors and to the National Parks that belong to us all. We can still use a few more folks to choose an adventure to support our youth programs. Sign up now to join Gavin and fellow Adventurers to get outside this summer.